Most people hire a tree service if a tree looks sick, needs to be removed, needs trimming, or they want to plant a new one. Working with trees takes time, certain equipment, and the experience to avoid injuring people or property. If you need tree removal, only trust the tree removal Peoria counts on for a safe and efficient process: My Backyard. Tree removal is a major process that tree owners have to do every now and again when a tree has died during the winter, become infested with pests or poses a danger to the home or property. You want to be sure and only pay for the service–not additional costs in lawn repair, fence repair or home repairs because it was done incorrectly. Consider this imperative information when hiring tree removal professionals. Ideally, you should always ask a professional tree removal service these questions before hiring them. By doing so, you will get the best tree service from the most qualified professional without endangering your home, property or family members. Additionally, if any tree service hesitates or gives you a difficult time when you pose the questions, move on to your next candidate. Don’t do business with anyone who doesn’t have these items. Period. This puts you, your home and property at risk if you go with the cheaper option of people who don’t bother to get these elements. Without insurance, you can be financially liable for damage done to the company’s workers or a neighbor’s property. Heavy equipment can ruin your yard. If they’re a certified tree climber, they may not have to use the same machinery than other novice companies. If they have a limited list of available equipment, it’s very likely that they won’t be able to get the job done properly. This field needs a variety of tools to successfully work. Without them, a tree removal company could injure the tree or the surrounding area. Don’t just take their word for it…do your research and look for people who have hired a company. Consider their own experience in your own decision. Unfortunately, salespeople for the company are meant to sell you on the services, not be upfront in the dirty laundry of a company. 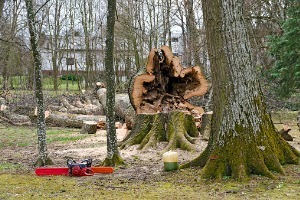 Overall, it’s best to be safe and hire the proper tree service to take care of your tree needs. You need someone with years of experience and expertise. Trust the tree removal service Peoria IL uses for their own fallen or dying trees: My Backyard. To learn more about our experience and schedule your consultation, contact us today!